Having no clinical to attend and only a three and a half hour work shift to get through, I had a nice quiet day. I downloaded another 45 songs onto my ipod (my ipod died so I borrowed my mini back from my dad but the battery life on that one was all of 45 minutes so my sister graciously gave me her old video ipod. Long story short, it's synced up with the computer in my parent's basement and since this laptop is brand spanking new, I have to go over to my parents every time I want to put new music on it) and then went grocery shopping with my dad. I picked up some tasty things including Cheese Strings! I haven't had a Cheese String in a long time but my good golly miss molly they're still as delicious and as much fun as I remember. Because I am still 12. I figured since I had a few bags of food and some spare time that I would whip up a nice dinner for myself and John. 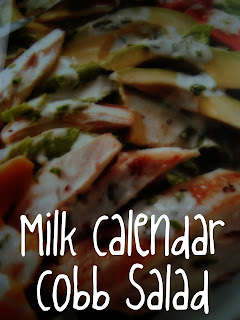 I'd been browsing through last year's milk calendar and came across a few recipes that I want to try. I was going to go for the baked cavatappi gratin but instead went with a cobb salad as my dad had bought us a roasted chicken and it was still so nice and warm. 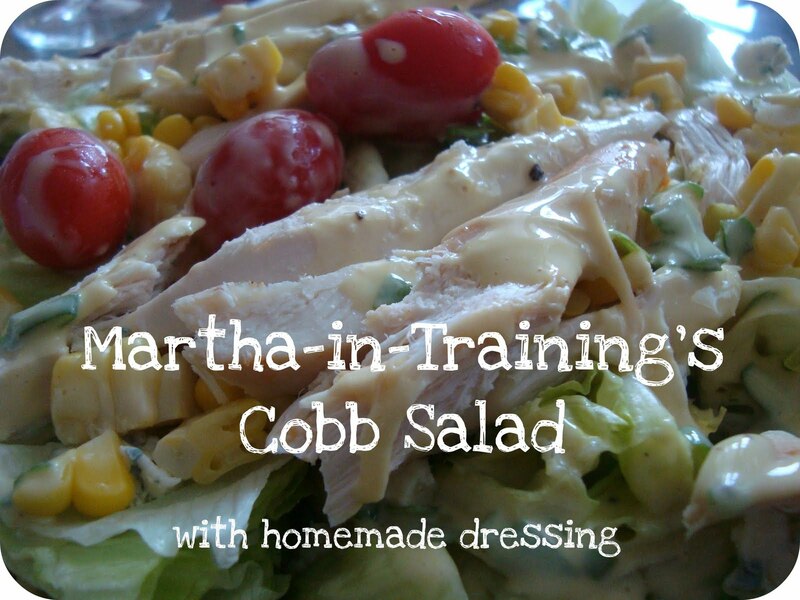 All you need is lettuce, corn, chicken, blue cheese (you can substitute in a different kind if you're not a fan of the blue) and some dressing. 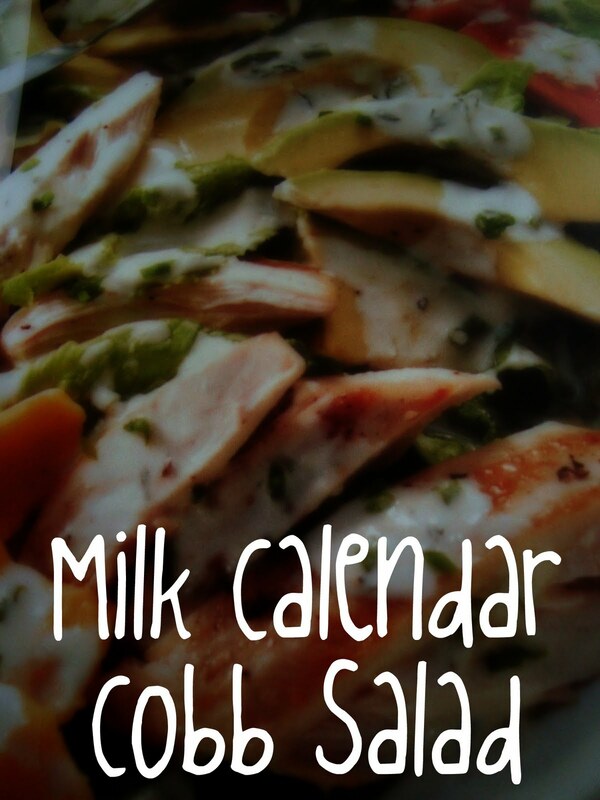 I made my own taking heavy inspiration from the recipe in the milk calendar only I switched up a few ingredients. 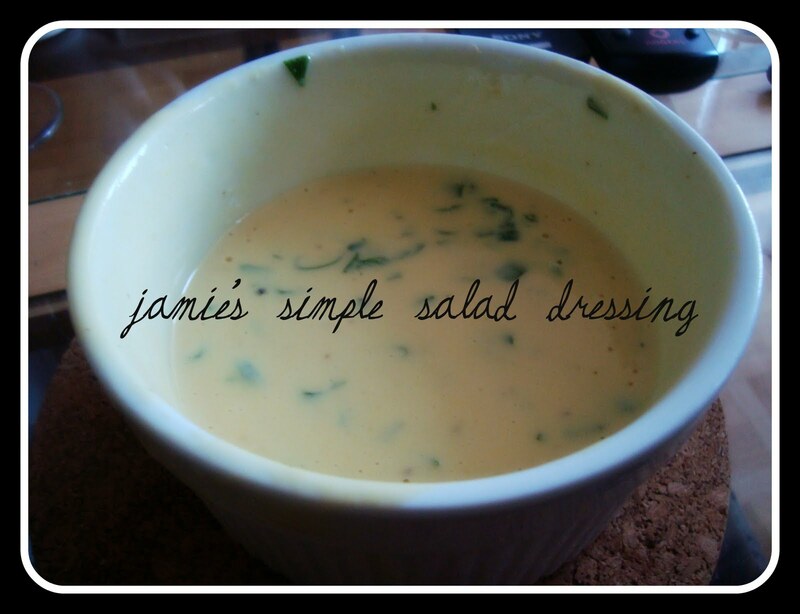 In a bowl whisk together 1/2 cup milk with 1/4 cup light mayonnaise and 1 tbsp mustard. Finely chop 1/4 cup fresh chives and mix into the dressing. Add in 1/8 cup red wine vinegar. Add in salt and pepper to taste. Give the dressing a final stir then serve over salad. I gotta go run some late night errands but I'll be back tomorrow with a new recipe!